On the beautiful waters of the Chippewa Flowage excitement fills the air every May for our two day event. To date our organization has helped more than 4,200 disabled fishermen and women get on the water in the Hayward Area alone. The atmosphere is one of friendship and camaraderie with people helping people. Every morning starts with muffins & coffee and every evening a cookout dinner along with some evening entertainment. Special adaptive fishing equipment is available for those have the need. Fishing Has No Boundaries ® tries to give those individuals a fishing experience who otherwise would not have such an opportunity. * FREE FISHING! No fishing license is required for the disabled fishermen and women during our event. 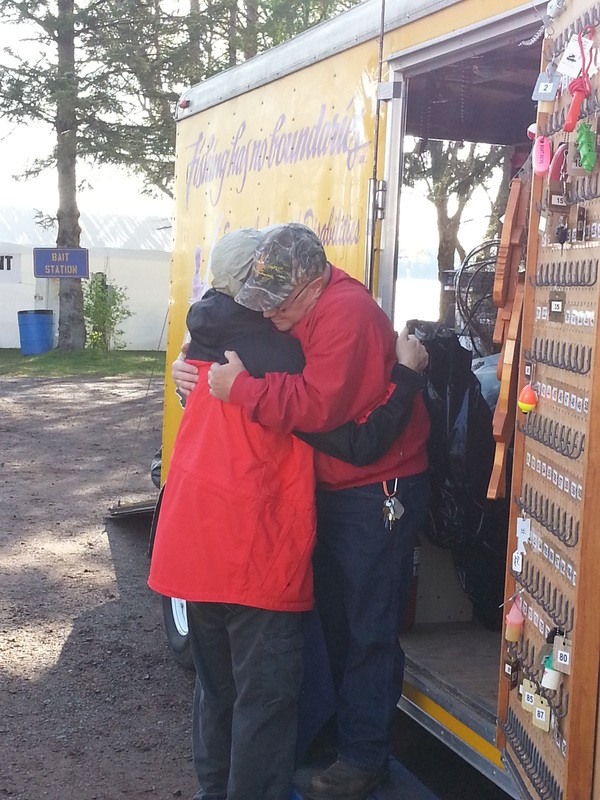 Best way to start the day is a BIG hug from old friends!! Bill Perlick and Tim D.
Are you interested in donating your pontoon or boat for the weekend? Would like to take our wonderful participants out fishing? 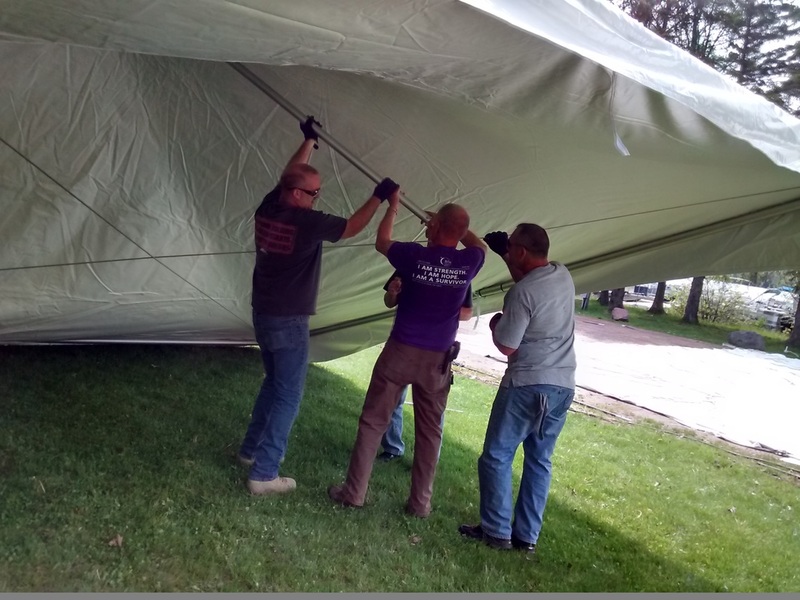 Are you interested in volunteering on the grounds of our event? 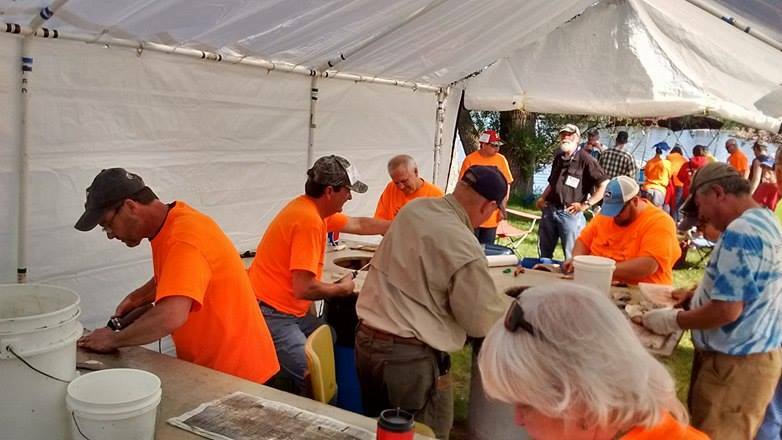 We have several volunteer opportunities throughout our event including working on the docks, in the kitchen, first aid, fish cleaning, and many more. Are you interested in volunteering with the FHNB organization throughout the year? You could come to our monthly meeting where we plan for the event or volunteer for some of our fundraising events so we can continue to take people fishing. Please be sure to print off the letters and forms and mail them to the Fishing Has No Boundaries office. Thanks! !